100% normal, fragrance free of charge, fast absorbed face cream moisturizes, hydrates and softens skin without having greasy feeling. Natural shea butter consists of natural vitamin A, D and E, penetrates deep into skin to provides back its elasticity. Sweet almond oil helps nourish skin, relieve dry and irritated skin. Natural golden jojoba oil with anti-inflammatory and antioxidant properties assists soothe, calm irritated skin and stability skin\'s organic oil. Aspen bark extract is used as all-natural preservative (alternative to chemical preservative), and it also contains properties of soothing, anti-inflammatory, pore cleansing, pore refinement. Moisturizing Encounter Cream is very good for sensitive and dry skin, and all skin types in cold, dry environments. 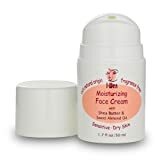 100% natural, lightweight face cream. Absorb quickly and without greasy after-feel. For sensitive and dry skin types. Made in the U.S.A.